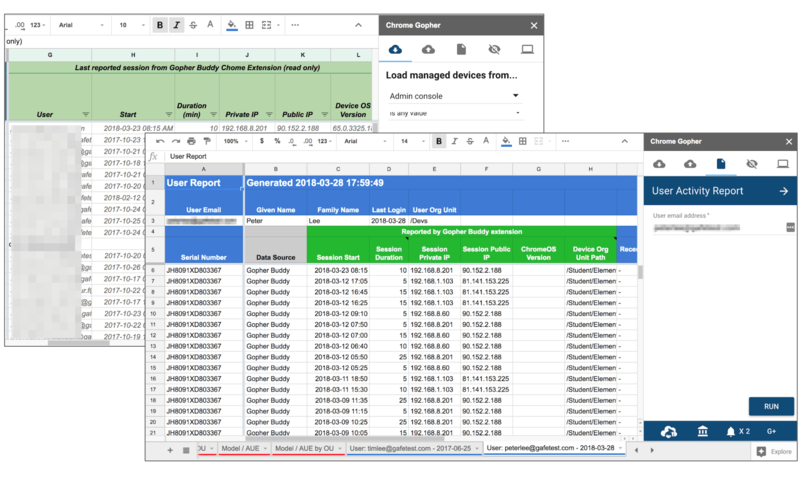 Extends the reporting powers of the Chrome Gopher Add-on for Sheets to include user sessions that capture username, local & public IP address, start time, and session duration in minutes. 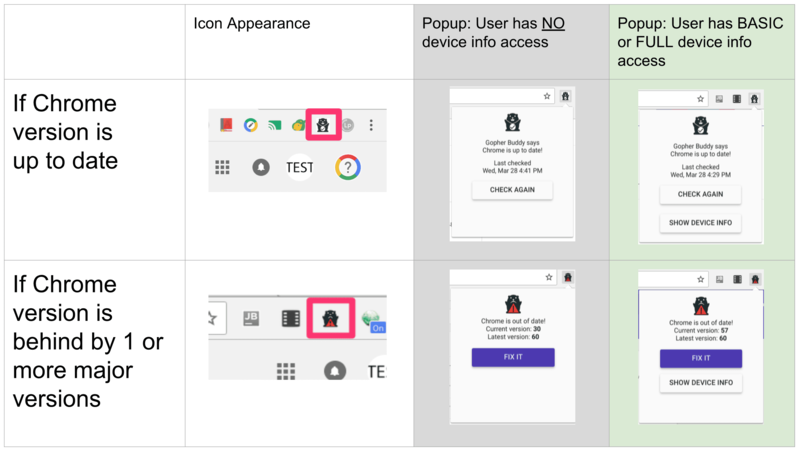 Nudges users to help prevent Chrome devices from falling behind in their OS updates. Access to Gopher Buddy is bundled as a part of our Chrome Gopher Premium, Gopher Pack, and Labs Unlimited offerings. 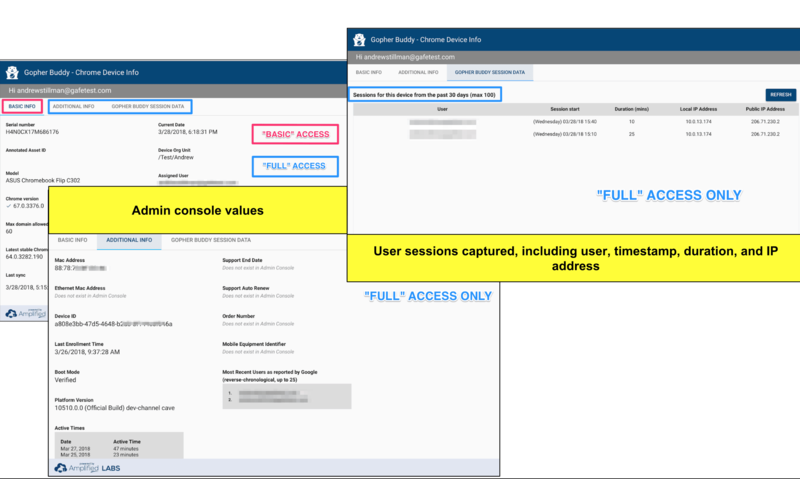 Gopher Buddy makes user session details available in the Chrome Gopher Add-on for Sheets. Includes username, local & public IP address, start time, and session duration — information not available via Google’s admin console or APIs. Extension only collects data on managed devices and users. The end user gets nudges to keep up their OS health. Selected users (defined by OU) gain access to BASIC or FULL device info panel. 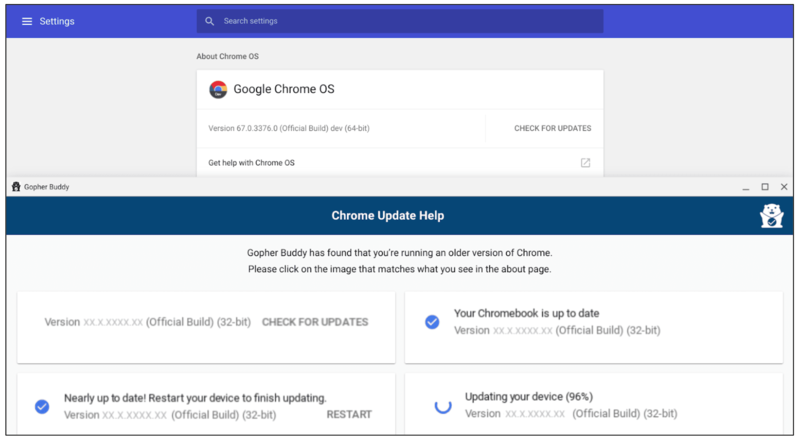 The Gopher Buddy Extension partners with the Chrome Gopher Add-on to unlock usage insights, put device data at staff fingertips, and nudge forward OS version updates on those laggard devices. In order to gain these new powers, the Gopher Buddy extension must interact with the Gopher Buddy Service, an Amplified Labs hosted API that must be installed, authorized, and configured by a G Suite administrator.